Ride Sharing Auto Insurance: Are You Protected While On the Job? Ride sharing has become a big deal in recent years. Uber launched in 2009. EcoRide powered up in 2011. Lyft debuted in 2012. More companies continue to join the ride-sharing revolution, and as they do they are recruiting more drivers to work part time or full time ferrying folks from place to place. If you are currently working as a ride-sharing driver, you are likely using your personal vehicle. You may have assumed you were insured while on the job under your personal auto insurance policy. This is not necessarily the case. Learn what you need to know to be protected while working as a ride-sharing driver! Ride sharing is at heart a service industry. There are many benefits to the growth of the ride-sharing industry, from reducing roadway congestion and greenhouse gases to providing jobs and economical local taxi rides. Ride sharing is essentially an arrangement between a driver and a passenger. The arrangement is made by using an app: this is how the driver and the passenger connect with each other. The app itself is managed and maintained by the company that hires the driver, and the driver typically uses their personal vehicle to transport the passenger. In this arrangement, there are actually three parties involved in any ride: the driver, the passenger, and the ride-sharing company. Does Your Ride Sharing Company Offer Commercial Coverage? Ride sharing is a relatively new industry, and one which the insurance industry as a whole has been slow to recognize and respond to. In the meantime, ride sharing itself continues to expand, adding new service options on what sometimes seems like a daily basis! 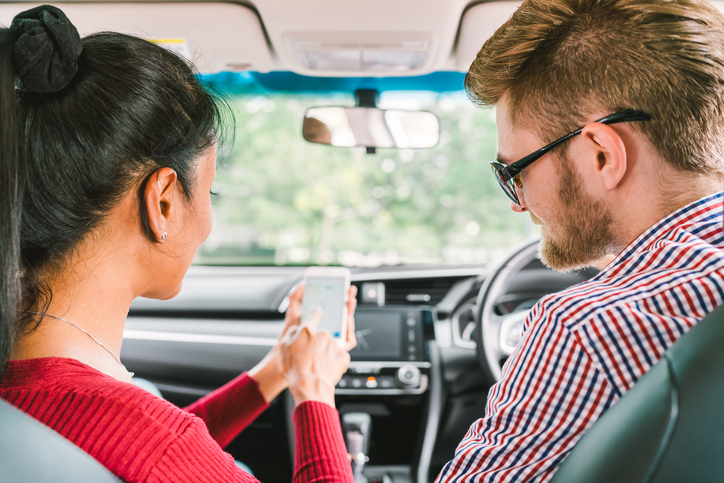 While ride sharing has been available throughout North America for at least the past eight years, only recently did the Financial Services Commission of Ontario approve commercial auto insurance coverage for ride-sharing companies. If you work for Uber, EcoRides, Lyft, RideCo, InstaRyde or Facedrive, the ride-sharing company provides a standard blanket commercial insurance policy provided by an insurance company. If you work for another ride-sharing company, it will be up to you to talk with the company management and learn what, if any, commercial coverage protects you while driving on the job. What About Your Personal Auto Insurance Policy? Even though you have commercial coverage through your agreement with, say, Uber, you are still using your personal vehicle. That vehicle is insured by a regular insurance company when it is not being used for Uber driving and the fact that you do ride sharing must be agreed to by your personal insurance company. It is critical that you talk with your agent or broker before you begin as a ride sharing driver. They may need to move you from an insurance company that does not allow ride sharing to one that does. And at this point, most insurance companies do not allow this use. Making it even more complicated, your personal insurance company may allow use by one ride sharing company (e.g., Lyft) and not another (e.g., Uber). One of the reasons is that the insurance company covering your personal car needs to know exactly what the ride-sharing policy covers. For example, let's say you are driving your vehicle on your way to pick up a passenger and you are involved in an auto accident. Who pays the claim? Are you a ride-sharing driver at that moment? Or are you a regular person until the customer gets into your car? Your ride-sharing policy may cover you once you have received and accepted a ride request. But it may not cover you while you are waiting to receive a ride request or after you have received a ride request but before you have accepted that request. In the same way, the ride-sharing policy may cover you while you are transporting your passenger. But the moment you drop off your passenger, and you are then waiting for another ride request to come in, you may not be covered. Imagine the mess this could cause. Your personal insurance company saying you were working at the time an accident happened, and they won’t pay. Your ride-sharing insurance company saying you had not started working yet, and they won’t pay. In the meantime, your car is wrecked, or even worse, you are injured and have associated costs. Even though you make all your payments on time, you could get caught without insurance if you don’t work this out with your personal insurance company. The only way for you as a regular person to know that you won’t get caught without insurance is to talk with your agent or broker before you start doing ride sharing. How Does Standard Ride-Sharing Coverage Work? Okay, so you have talked with your broker. Your personal car insurance company is cool with you being a ride sharing driver with the particular ride-sharing company you have gone with. The ride-sharing company tells you that you are covered under their standard policy. All is well, so time to stop worrying about insurance and go make some money. Right? Well… almost right. Ultimately, making sure you have adequate auto insurance coverage in place to protect you while working as a ride-sharing driver is up to you. Even if your ride-sharing company does provide some type of standard one-size-fits-all insurance coverage to you as a contractor-driver, it may not be sufficient to fully protect you if you have an incident on the job. For this reason, it is critical to read the fine print of the standard insurance protection issued by the ride-sharing company, so you know precisely what and how much coverage you have during the times you are covered while on the job. For example, what is the coverage and what is the deductible if your car is damaged? How about coverage if you are injured? Or if someone sues you? The same important questions that you need to look at on your personal car insurance also apply to the commercial insurance you have through the ride-sharing company. If after reading all of this you are even more confused, give us a call or contact us online. The truth is that it is not simple. Bring in a copy of the insurance agreement from the ride-sharing company and let us help you understand the fine print on that policy. Even though you do not get that insurance through us, helping people through mazes like this is exactly what we as brokers do. And we will be sure you are with a personal insurance company that allows ride-sharing with the ride-sharing company you are going with. Here at Mackay Insurance, we help you understand what insurance you have and what you need. Give us a call at 888-853-5552 to learn more about ride-sharing insurance coverage.